Are you a nature lover? Apley House is the spot for you. You can see eagles flying overhead while you walk sandy trails that lead around cranberry bogs and wooded ponds. 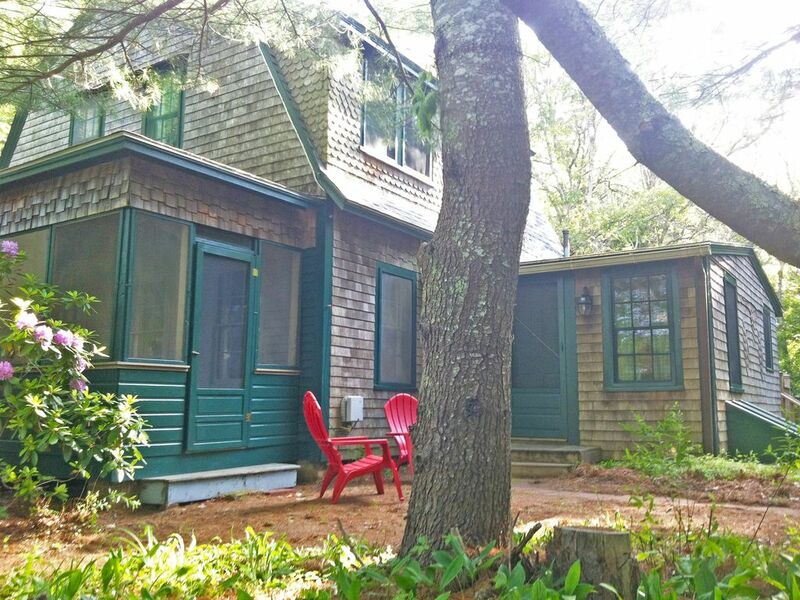 Enjoy swimming, fishing and boating from your own private beach on pristine Long Pond. Apley House has hosted happy family vacations for over 80 years. It offers spacious housekeeping accommodations for up to 9 people. The cottage has four bedrooms, a country kitchen (renovated in 2016! ), and a large, comfy living room with fireplace. Exterior gathering spaces include a screened porch in front, deck in back and a large yard with plenty of space for lawn games. There are two baths: downstairs has a spacious shower (new 2016) and laundry area (new 2016), the upstairs bath has a historic clawfoot tub with hand shower. Situated in the middle of conservation land, this spacious summer home is perfect for people who enjoy water-sports and the outdoors. You can swim, fish and boat on one of Southeastern Massachusetts' pristine glacial lakes. Enjoy quiet strolls along woodland paths and visit the nearby historic sites in Plymouth and Cape Cod. Plus, Apley House is just a short drive away from shops, ocean beaches and Plymouth's great golf courses. Avoid wrangling with Cape Cod traffic and stay in Plymouth. There's so much to do in the area: Swimming, fishing and boating are favorite activities on Long Pond. The lake is well-stocked each spring and there is a public boat ramp for access. Ample hiking and bicycling trails head into the Wildlands Trust properties next to the cottage and lead you through woods and cranberry bogs around Halfway and Gallows ponds. The scenery is magnificent. We've seen osprey, eagles, mink, and more. It's an easy drive to the near-by Plymouth and Cape Cod tourist sites; it takes about 15 minutes to drive to Plymouth Bay beaches and Plymouth Plantation. The Lower Cape beaches are about 45 minutes away and it is less than 3 miles to Pine Hills and many great Plymouth golf courses! We have additional cottages and cabins about 1/2 mile away from Apley House. You can add these to your rental or take them individually as one, two or four bedrooms. We are occasionally able to accommodate larger groups (up to 35) in the entire property. The property is currently owned jointly by five siblings, descendants of Lily and Richard Conant (grandparents) who inherited the property from a close family friend and Rick and Gerda (our parents). Our children are the fourth generation to summer on Long Pond. The photo shows our mom and her five children. Although much of summer life on Long Pond is focused on the water, we love the woodland paths and walks that surround Apley House. Our family is committed to preservation of this area -- we donated 40 acres of woodland just next to the cottage to the Wildlands Trust and the State of Massachusetts recently acquired the property abutting the other property line. You can walk from the yard of Apley House onto nature paths that take you by two neighboring ponds with magnificent views, eagle's nests and scenic cranberry bogs. The house has all the classic details of an old summer cottage, simple but beautiful wood details, high ceilings on the main floor and cottage construction. The upstairs bathroom has an old-fashioned claw foot tub. The downstairs bathroom has been newly renovated with a spacious shower and tall shower head, new toilet, new flooring and vanity area. The cottage sits in the midst of conservation land. Trails lead out from the yard. Long Pond is a clear, clean lake -- great for swimming, fishing and boating. Private waterfront on Long Pond. The lakefront has a small dock and raft. The cottage comes with the use of a canoe. There are three dining areas: in the kitchen, in the living room and on screened porch. Highchair supplied upon request. There is a large side yard suitable for games. A two-person canoe is included with the rental at no extra charge. The grill is just off the back deck. The screened porch is on front of house. Liked the location, loved the rustic authenticity, but DID NOT realize there was NO HEAT, other than a fireplace (which we didn’t use), or from a couple electric heaters located in a closet. The cold was ok, but the cold rain caused a dampness in the House when we returned each evening. Wonderful second stay at Apley cottage. Highly recommended. This is our second stay and we are once again highly pleased. The house is always in perfect order on arrival. Our guests and we rave about the comfort of the beds. The bath and beach towels are a nice plus this year. The kitchen is well appointed with pots, pans, and utensils. There is a new flat screen TV and the internet is reliable. Cell phones work great here as well. The beach is small but the pond is clear bottom and the raft is a blast for adults and children. We always bring fans from home to add to the ones provided so the house is cool even in very warm weather. The owners are very responsive to any needs. We are already on board for next year! We loved this cottage ! Not fancy, but comfortable, which is exactly what we were looking for with young grandchildren. Downstairs has a large living room complete with a fireplace and table with leaves to seat a crowd. Kitchen is great. Upstairs was a little warm but 3 bedrooms and bath very pleasant. Long Pond is awesome, clean, and with the dock and raft, the kids had a blast. The dirt road makes you feel far away from it all, but when you need to get on the highway it's only minutes away. The trails and woods surrounding the cottage were a bonus, well maintained and great for nature walks or running. Thanks for the memories ! We had a fabulous time. Perfect for our 3-generation family. Great old summer cottage. Perfect combination of rustic and comfortable. Fully equipped. The property’s private beach is gorgeous. Crystal clear water. Sandy beach and bottom with a nice gradual increase in depth so our toddler grandchild could wade in. We enjoyed swimming, paddling in the canoe, and just sitting by the lake. The beach offers a nice mix of sun and shade. We enjoyed evening meals on the screened-in porch and great hikes on the trails through conservation land right near the property. We can’t wait to go back. The cottage was as described. We really loved the charm of it. We really enjoyed our stay. Our grandchildren came and spent 4 days with us and really enjoyed the water. The cottage had plenty of room for all of us and had everything we needed. Though there is no A/C there are plenty of fans provided. It is very peaceful and rustic which I truly enjoyed. We spent the day in Plymouth at the Plantation and Plymouth Rock which our granddaughters truly loved. If you want peace and quiet and relaxation this is the cottage for you. Would definitely rent again. The cabin was super clean, the bedrooms were spacious, the kitchen was fully stocked with dishes and pots and pans, the hot water was plentiful. On one night, we had 9 adults stay over and we we very comfortable. We had 11 adults over for a cook out and the 5 burner grill handled all the cooking. The landlord was always available and answered all our questions promptly. It was a absolutely positive experience and I would highly recommend renting from Susan and family. There is only one issue, and I'll put the "blame" on me. I should have asked or done more research. The cabin is waterfront, but the waterfront is across the street and down a trail about 100', so we didn't get a water view. The trail to the water was a little steep so guests will mobility issues couldn't enjoy the beachfront. The beach itself was great, the shore had a sandy bottom. Again, we had a great time and would highly recommend this cabin. Beautiful Long Pond has clean, clear waters and a sandy bottom. With a high percentage of natural shoreline, the pond offers a peaceful respite. The landscape is covered in pine woods. Much of the property surrounding Apley House has been preserved as conservation land. You can walk for miles on the sandy trails. All of the tourist sites, golf courses and beaches in Plymouth are very close -- less than 20 minutes away. You can access the Lower Cape within 1 hour and the Outer Cape is a hefty day trip.